I feel like I've spent the entire month hibernating in front of a the fire... reading. After an autumn where I just didn't feel like reading very much I've more than made up for it by reading eight books through January. For some that may not be all that many, but for me that's a *lot*. Of course, it wasn't supposed to be this way. My husband was due to have knee surgery at the beginning of the month but because his long term blood sugar was too high it was postponed while he works on getting it down. No idea when it will now happen but my guess is, not until well into Spring. Several very nice book blogging friends emailed to ask how he was and I thank them for that. 1. The Willows - Algernon Blackwood. A weird story which I read about in The Fellowship of Ghosts by Paul Watkins. I found the novella on the net and downloaded it to my Kindle. I enjoyed the sense of place, ie. an area on the River Danube, and the idea that a place can be so close to another dimension or world that the border is very thin and things might cross over. But I also found it rather too rambling and overly descriptive. My mind kept wandering to be honest. 8. Bill Oddie Unplucked - Bill Oddie. A household name in the UK, Bill Oddie was a TV presenter of wildlife programmes until a few years ago when ill health intervened. The book contains fifty of his essays, magazine articles and blog entries. They're mainly connected with his love of birds, recounting trips to farflung places to film for the TV, personal birding trips, describing his wildlife friendly garden and so on. All are entertaining as well as funny but also often make a serious point concerning the subject in hand. I enjoyed this very much. Bill always makes me think, sometimes making me form an opinion on things I've never given much thought to. I like his forthrightness even when his opinion may not be a popular one. A great pity he's not on TV very much now. This is my book 4 for Bev's Mount TBR 2017. So, an excellent reading month and a varied one as well. Six fiction books, two non-fiction, all good reads. I'm still majoring on crime stories it seems, four of those read this month, plus two ghost stories. Of the two non-fiction one was biographical the other essays. I think that's a pretty varied crop of books and I'm quite happy with that. 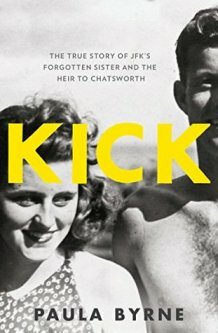 Kick: The True Story of JFK's Forgotten Sister by Paula Byrne. This was just so readable and interesting... loved it to bits. A couple of crime titles to review today. 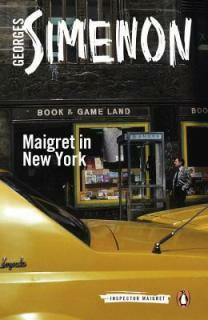 First up, Maigret in New York by Georges Simenon. Maigret is now retired and living the quiet life in the country. His rural idyll is interupted one morning when a young man, Jean Maura, comes to call. He is French but his father lives in New York having moved there as a twenty year old. Just recently Jean's been getting letters from him that have given him cause for concern. He wants Maigret to take the boat to New York with him to help discover if his father is in some kind of trouble. It's the last thing the retired police inspector wants to do but eventually he is persuaded. Immediately the ship docks Jean Maura disappears. Maigret is now in America, speaking very little English and with no clear idea of where to begin to solve this mystery. But is there a mystery at all? The father is being very cagey and unconcerned. And if there is a mystery, has Maigret any business interfering where he has no jurisdiction? This is #27 of the Maigret books, written in 1946 according to Goodreads. I was surprised to find him retired in it because there are loads more books after 1946 so I can only assume the timelines skip around a bit or he comes out of retirement as I remember Hercule Poirot did. Odd. Anyway, I enjoyed Maigret's expedition to New York very much. His culture shock was severe, partly because of the language barrier, but mainly to do with the idea of personal freedom that pervades the American way of life: the French are much more into officialdom, form filling and so on. Poor Maigret found it hard to cope. I did get a bit confused about who was who and who'd done what to whom and when, but got it sorted in the end. Not bad but think I prefer the earlier Maigret outings for atmosphere. And as to ITV's new productions of Maigret, starring Rowan Atkinson, I enjoyed them but am not really sure he suits the part. Suspect he will grow on me. 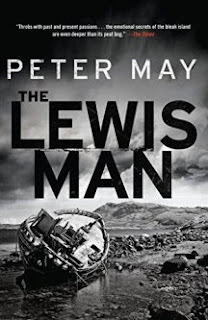 Next, The Lewis Man by Peter May. Fin McLeod is back on the island of Lewis after divorcing his wife and giving up his job with the Edinburgh police. He has nowhere to live so is outdoors in a tent. A body has been found in a peatbog and at first it's thought to be thousands of years old, until a tattoo of Elvis is discovered on one of its arms. This is now a murder enquiry. Fin becomes involved when DNA reveals that the murdered young man is related to the father of Marsaili, his girlfriend when he was a teenager, and mother of his son. Marsaili's father, Tormod, has always professed to have been an only child with no living relatives. The problem is that he is now in the throws of dementia and answers to questions can't be relied upon. How on Earth can the truth be got at after all these years? Well, this was quite an enthralling tale. It was a slow burner, gradually working up to being quite fascinating by about halfway when family history really starts to become the important aspect of the story. There are two parallel timelines going on, the events of the modern day dealing with Fin's investigations and personal problems, and that of sixty years ago told by Tormod in the first person. It sounds confusing but is not at all and works extremely well. The whole thing is compelling, it was a book I kept wanting to pick up read more of to find out what happened, but not just what happened... 'who' exactly people were. To be honest, as a whole, it was rather a sad tale so don't pick this up looking for cheerful story because you won't find it. What you will find is a beautifully written book with a wonderful sense of place in the island of Lewis, in the Outer Hebrides. There are some gorgeously descriptive passages that transport you right there, in all weathers... good, bad and downright diabolical. This is book two in May's 'Lewis' trilogy, the first book being The Black House which I read in 2013. I hope to read the final instalment, The Chessmen, later this year. The Lewis Man is my first book for Peggy's Read Scotland 2017 reading challenge and my book three for Bev's Mount TBR 2017. 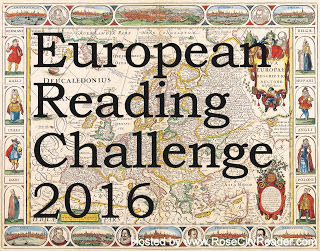 Very pleased to have completed this fun challenge and many thanks to Rose City Reader for hosting. My second book for Bev's Mount TBR 2017 is The Haunted Library, edited by Tanya Kirk. This British Library collection of ghost stories comprises a dozen tales by a few authors that were very familiar to me and quite a few that were not, which is always nice. All concern books, libraries or bookshops in one fashion or another. The first story in the volume, Afterward by Edith Wharton, an author whose books I've read several of, was one I thought I ought to have read before but couldn't remember. It involves an American couple who move to a secluded house in Dorset after selling a mine in America. The wife feels something isn't right after a man is seen walking up the drive... her husband goes to meet him but then gets rather shifty when asked about the episode. The writing, as always with Edith Wharton, was superb but the story didn't really convince me somehow. It felt contrived but was still enjoyable for the setting. A well known tale by M.R. James, The Tractate Middoth, follows that, concerning a man looking for a book in an Oxford library and why he has to find it before a certain relative. Beautifully written but, for me, not one of James' best. Bone to Bone by E.G. Swain concerns a man who hears noises in his private library at night, goes to investigate and finds a book is sending him messages about going into the garden. A fun story. The Whisperers by Algernon Blackwood tells of a man who sleeps in the attic of a friend's shed, amongst his books, and hears voices in the night. An ok story but it seems I don't like this author's stories as much as I thought I did. I liked Fingers of a Hand by H.D. Everett very much. Two maiden aunts are looking after neices and nephews and take them for a holiday in a cottage by the sea. Suddenly they're getting written messages all over the place telling them they must leave the cottage immediately. Nicely written and spooky. I thought it was based on a certain real life incident on the south coast but the one I'm thinking about happened well after the story was written, so it can't have been. The Nature of the Evidence by May Sinclair is about a man whose beautful wife dies. Before she pops her clogs she tells him he can marry again but if it's the wrong woman she'll make it known, after her death, that she disapproves. Naturally she does. I thought this one was a bit ridiculous to be honest. 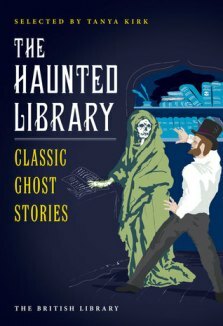 Mr. Tallent's Ghost by Mary Webb concerns a publisher haunted by a writer he didn't publish because the work was so bad, and The Lost Tragedy Denis Mackail is about a lost play by a famous playwright. Both of these were a bit so-so. The Book by Margaret Irwin was quite good, telling the story of a man who notices that there's always a gap on the second shelf of his bookcase, whether a book's been taken out or not. He finds a strange book then that has a malevolent affect on him and his family and starts telling him to do things. This was a good, atmospheric, tale. I thought The Apple Tree by Elizabeth Bowen was one of the best stories in the book. Simon Wing, a middle-aged bachelor, suddenly marries a nineteen year old girl. Friends are worried and this is nicely put over by the use of a house party and two observers, Mrs. Bettersley and 'Lancelot' who discuss the problem as the story progresses. The new wife is strange, mixed up in some peculiar tragedy while she was still at school. Mrs. Bettersley is actually afraid of her... Very nicely written, creepy and full of atmosphere. Herodes Redivivus by A.N.L. Munby was also very good. A man is invited by a friend to go to his flat one night to look at his books. The man discovers that his physician friend owns the very copy of a book that frightened him as fifteen year old boy. He had been wandering in Bristol and found an antiquarian bookshop down an alley. The bookshop owner was weird and offputting but sucked the boy in by showing him his private collection of books. This was a definitely a weird tale, nicely told. The last story in this volume is The Work of Evil by William Croft Dickinson. The Keeper of Printed Books at a library is back after a long illness. He decides to show one of his employees the Special Collection which until now he's kept locked away and barred access to all. Why is he doing this now? Is there an ulterior motive? Interesting and creepy. This was an enjoyable collection of ghost stories. Like all short story collections there are standout stories and ones that don't work so well. I also thought that sometimes the book connection was a bit tenuous, ie. books weren't necessarily the focal point, there just happened to be a library somewhere in the story. To be honest I didn't mind because even if the story did not work that well for me it was always well written and worth reading for the setting or the atmosphere or something. Hmm.. I think I said I would only be doing two challenges this year. Famous last words. 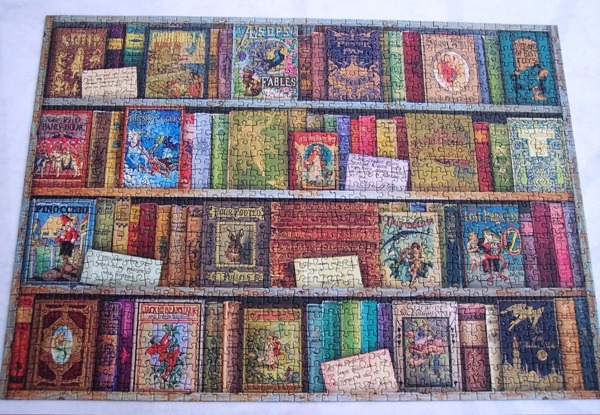 I saw this on Bev's blog and can't resist it because it's all about places and where books are set. I love the idea of it and can't resist having a go. I can see that some letters will be more difficult than others but hey, nothing ventured... and it sounds like so much fun. I'd read a bit about Kick Kennedy in Wait For Me! by Deborah Devonshire, as Kick married her husband's elder brother, and since then have wanted to read more about the Kennedys in general, just not got around to it. Kick by Paula Byrne was one of Nan from Letters from a Hill farm's favourite books of 2016 and as Nan liked this book so much I decided to give it a go and was lucky enough to find a copy in my local library. From a very young age she shone. She was brave and fearless, intelligent, charismatic... the sort of person who lit up the room when she entered... everyone but everyone adored Kick Kennedy. It was not an easy family to grow up in though. The children's mother, Rose, was a devout Catholic and dedicated her life to making sure her children were as devout as her. Plus, with so many siblings you had to be something special to be noticed and had to be able to hold your own in family discussions, of which there were many as of course the Kennedys were an intensely political family. They were the first Irish Catholic family to rise to political prominence in America and it was Joe's ruthlessness which had made that so. In the years leading up to WW2 the family led an idyllic life, educated in the best schools, money no object, and wonderful holidays in Florida and Cape Cod. In 1937 Joe was appointed American Ambassador to Great Britain and the family moved to London in 1938. In less than eighteen months the country would be at war with Germany but until then the Kennedy children became celebrities in a country which had never seen anything like them. The 'personality kids', young and good looking, were especially popular and Kick in particular discovered that men really liked her. They were in fact falling over themselves to court her. It wasn't long before Kick fell completely in love with England, its people, and its ways. She had many admirers and dated a lot of them but eventually she was to meet Billy Hartington, eldest son and heir to the Duke of Devonshire and owner of Chatsworth House in Derbyshire. They fell in love but there was one huge obstacle to their marriage: religion. Kick was Roman Catholic... the Devonshires not just fiercely protestant but historically one of the most anti-catholic families in the land. It was to cause Kick huge heartache and cause a rift with her family that was very slow to heal. So here we have my first Goodreads five star book of 2017. I *loved* this book to bits... whizzed through it in about 3 days and now want my own copy. (Nan said I would...) The Kennedys are a family that I've wanted to read more about for a while, but I didn't know where to start, so I didn't. Kick, in fact, turns out to be the perfect place. There is much casual information about the family, ie. the parents, Joe and Rose Kennedy, where they came from, what they were about and so on. I say 'casual' because it's put over in a very readable way and there aren't pages and pages of dry reading to plough through. It's all very accessible and easy to absorb. The book, of course, centres on Kick, but I learnt an awful lot about the two brothers she was closest to as well, Joe jnr. and Jack, because of course Kick didn't exist in a bubble. I knew nothing about Joe other than he died in the war. I knew more about Jack, obviously, but wasn't aware that he was often very ill and constantly in and out of hospital when he was young. Lots of other people come in and out of the story too. Kick was so immensely popular that wherever she went she affected everyone with her vivacity, sheer niceness and ability to make whoever she was talking to feel like they were the only person in the world. Men fell for her in droves even though she wasn't traditionally beautiful, she just had something about her that made people love her. One of the things that surprised me, even though Deborah Devonshire did touch on it in Wait for Me!, was how the Kennedy family took London by storm when they arrived in 1938. We think the cult of 'celebrity status' is a recent thing. Er... no. The doings of the three Kennedy 'personality kids' were followed massively in the papers and they were photographed constantly, everyone wanted to get to know them and to be seen with them. Rosemary was the Kennedy's oldest daughter, not physically disabled but mentally retarded after a botched birth. Joe Kennedy ordered brain surgery for the young woman and it failed miserably, it made my blood run cold to read about it to be honest. Awful thing. And after that tragedy followed tragedy, starting with WW2 and carrying on after. Even though I knew what happened to Joe jnr., Billy Hartington and Kick herself it still hit me hard as I had felt I'd got to know them by the end of the book. Of course worse was to come with JFK himself but that is not touched on in this book. So much more I could say about this delightful book. It's overall an excellent read, well written, good with atmosphere (I felt I was right there in the 1920s and 30s) and informative. I now want to read more about the Kennedy family so will investigate to see what's around and what's recommended. I do in fact own Jack by Geoffrey Perret, so will get to that very soon as well. I feel like Kick was a terrific introduction to the Kennedy family and I'm ready now to read on. My first book reviews for 2017 are two crime stories from series that I started last year or have been reading for a couple of years. Nice to start the year with two reliable authors. Excellent that my second book of 2017 is one I didn't want to put down. This is my second Daniel Jacquot book and both of them have been like this. 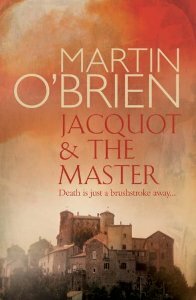 I can't decide whether it's the quality of the writing, the glorious setting or the fact that the mystery was so good... a bit of all three I think. I had no idea until close to the end who had done what and to whom. And as with the first book there was a nice little twist at the end. There's a bit of romance which works well as it doesn't overpower the story at all and feels 'real' in that there are misunderstandings and difficulties and so on. There are nine books in this series and I'd like to read them all this year. I think the timeline meanders a bit and it's not clear which order the first three or four should be read in but as long as it's not crucial I don't mind that too much. Good series. It's October in Alaska, Kate Shugak's favourite time of year. She's looking forward to stocking up for the winter and her plan is helped when a moose appears on her land... she shoots it for her larder. The unexpected arrivel of her grandmother, Ekaterina Shugak, is a blessing as she then has help to butcher and store the animal. It takes three days to do this and it's only then that 'emaa' tells Kate why she's there. She's head of the Niniltna Native Association and two of their members have just died... both of them likely to vote with her on a new development project that will affect the local native population. The last thing Kate wants to is leave her cabin to spend weeks in Anchorage. But it's tne annual convention of the Alaska Federation of Natives and her grandmother is sure that Kate could use it to investigate and discover whether the deaths were accidental or something else. Despite her unwillingness, Kate, naturally, has no real choice in the matter... emaa always gets her way. This is another instalment where we learn more about Kate's Indian roots. The series seems to be split into plots that are either mainly crime based like A Cold Blooded Business where Kate is out on an oilfield or, like this one, Blood Will Tell, where we learn an awful lot about how things actually are for subsistence level natives just trying to hang onto their own land. Plus, how all the various factions in Alaska really work and whose interests they have at heart (their own). To be honest it's a bit disheartening although this book was written 20 years ago so maybe things are better now. Faint hope I suppose. Anyway, as always I enjoyed this, book 6, of the series. There's always such a fabulous sense of place, unsurprisingly as Dana Stabenow lives in the state so knows of what she speaks. The two deaths are almost in the background of this story as we learn about politics in Alaska and watch as Kate deals with her boyfriend, Jack's, fight to hang on to full custody of his son. Not my favourite in the series so far but a jolly good read nevertheless. 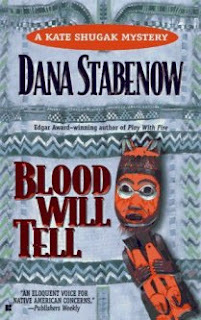 Blood Will Tell is my 1st. 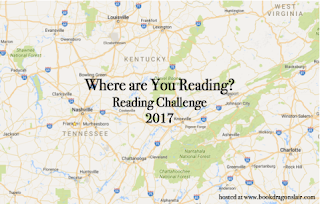 book for Bev's Mount TBR 2017 challenge. 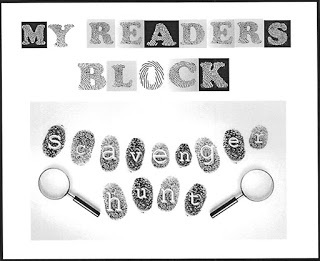 I thoroughly enjoyed doing Bev's Vuntage Mystery Scavenger Hunt last year. 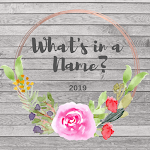 Loads of fun filling in the categories and reading some very good vintage mysteries. Anyway, time for the wrap-up post. 1. The Franchise Affair - Josephine Tey, 1948, Spooky House. 2. A Mystery in White by J.Jefferson Farjeon, 1937, Christmas tree. 3. Whose Body? by Dorothy L. Sayers, 1923, Dead Body. 5. Death of an Airman by Christopher St. John Sprigg, 1934, Plane. 6. To Love and Be Wise by Josephine Tey, 1950, Building other than house. 7. The Murder of Roger Ackroyd by Agatha Christie, 1926, Telephone. 8. The Judge's House by Georges Simenon, 1940, Bird. 9. The Daughter of Time by Josephine Tey, 1951, Jewellry. 10. The Labours of Hercules by Agatha Christie, 1947, Any other animal. 11. The Singing Sands by Josephine Tey, 1952, A body of water. 12. The Santa Klaus Murder, 1936, A yellow object. For the first time in quite a few years I didn't receive any books for Christmas. Oddly, I was quite ok with that as I have *cough* plenty of books on my tbr mountain and I really do want to read them. I did however pick up several on a shopping trip with my daughter and grand-daughter between Christmas and the New year. I love physical atlases which show all the mountains and plains and goodness knows what else and I don't own one... or rather I do but it's a Times one that belonged to my mother-in-law and is so massive I can hardly lift it off the shelf. 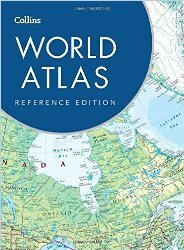 My other atlas just shows the countries and is so ancient the USSR is still shown. So I wanted a new, normal size, physical atlas. Anyway, I saw this in The Works for £10 and just could not leave it there. I know it's a slightly odd thing to be a map freak but there ya go... I love my new atlas to bits. 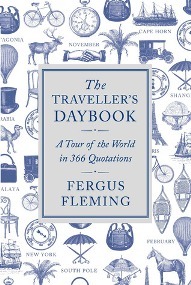 This is The Traveller's Daybook compiled by Fergus Fleming. It gives an excerpt from various books of travel writing for every day of the year. Travellers such as Thor Heyerdahl, Nansen, Isabella Bird, Charles Darwin as well as less obvious people like Ted Hughes, Evelyn Waugh, E.M. Forster are featured. I plan to read this through the year - have already started in fact - and have a feeling I'll end up with a lot of new authors to try when I get to the end. I even wonder if I might want to read it every year. 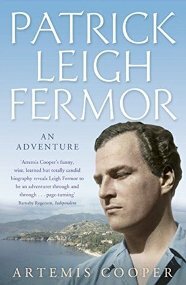 Next, Patrick Leigh Fermor: An Adventure, by Artemis Cooper. I've been after this biography for a while, waiting to see it in the library or a charity shop, and lo and behold there it was in a British Heart Foundation shop for £1.50. If you're patient this can happen quite a lot... sadly, I'm not always patient enough. I've read Patrick Leigh Fermor's A Time of Gifts, his one fictional book, The Violins of Saint-Jacques and a volume of letters between him and Deborah Devonshire, In Tearing Haste. All these led me to believe he led a very exciting life so I was very pleased to find this as I gather it's a very good biography. Several generations of Stevensons, starting with Robert Stevenson, apparently built every lighthouse around the Scottish coast. 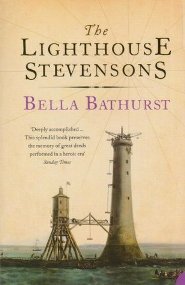 The writer, Robert Louis Stevenson was his grandson but before him the name of Stevenson was synonymous with lighthouse building. This is their story. I bought this from Amazon before Christmas, partly because I've wanted to read it for a while but also I thought it would do nicely for the Scottish reading challenge I'm doing this year. 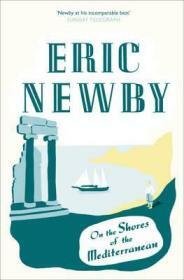 I've read several books by travel writer, Eric Newby, and enjoyed them all, especially Love and War in the Apennines. I didn't know he'd done a tour of the Mediterranean countries with his wife, using all kinds of transportation, and written this book about their experiences. Having read Carol Drinkwater's book where she did something similar, but based on the olive tree, I had to have this and nabbed a copy from Amazon Marketplace. It's 500 pages but I think I will love it. And the good thing about all of these books (apart from the atlas) is that they all qualify for Mount TBR 2017. Time to wrap up my main reading challenge for 2016, Bev's Mount TBR 2016. 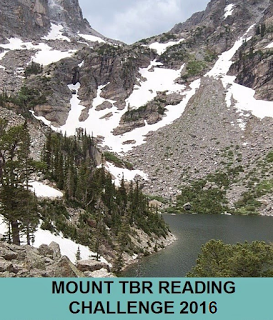 My aim was to climb Mont Blanc and in the process read 24 books. This I finally achieved on the 22nd. December. I got off to a roaring start and was usually 3 or 4 books ahead of where I should have been for most of the year, but I tailed off in the autumn. Never mind, I made it and that's the main thing. Don't count your chickens... Follow That Bird!